Looking for a gritty 4X (eXplore, eXpand, eXploit, and eXterminate) strategy game that puts you right in the middle of the Warhammer 40,000 universe? Look no further than Warhammer 40,000: Gladius - Relics of War, the latest game set in Games Workshop's grim-dark future setting where there is only war. Players will be taken to Gladius Prime, a planet where a ton of ancient relics have just been discovered, are the key to several terrifying secrets. That includes a series of dangerous ancient beings that the folks on Gladius have been forced into war with. From there, this challenging title finds you controlling four different factions: the Space Marines, Orks, Necrons, and the Astra Militarium. Each is rife with an exhaustive roster of units with their own specialized combat roles to help lead you to victory. They've also got their own personal reasons for heading to the world of Gladius Prime and engaging in battle. While the game is a fairly typical turn-based 4X strategy affair in many respects, but it also features some interesting twists as well, like the fact that the game centers solely on war. There isn't any way to make peace with other factions, so diplomacy isn't on the menu. What is? Oh, just tons of carnage on randomly-generated maps with resource gathering, strategic skill unlocks, and Research Trees to better your units. And tons of annihilation. Plenty of it. 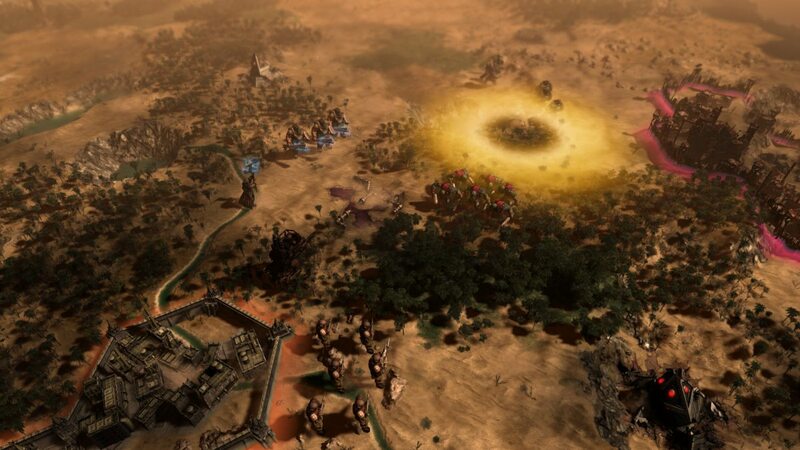 Warhammer 40,000: Gladius - Relics of War is available now on Steam. For additional strategies and tactics, be sure to check out our Official Warhammer 40,000: Gladius - Relics of War Wiki!